To ensure that BlueSky Furled Leaders were more than just beautiful tapered leaders,we enlisted the help of several fly fishing experts to thoroughly test the leaders in the toughest conditions to make sure they would do the job. Here are some of the people who continue to provide us with their time and talents to make sure you get the best possible BlueSky Furled Leaders. One of the first field testers for BlueSky, Bob fishes both fresh and saltwater species. Semi-retired, Bob is a very creative fly designer and does commercial fly tying. His patterns are noted for their durability and practicality. As a FFF Certified Fly Casting Instructor, Bob enjoys teaching fly casting to both beginning and advanced students. 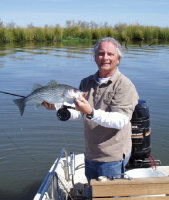 He now lives in Northern California and loves to fish the San Joaquin Delta area often. He has fished exotic locations like Kamchatka, the high Arctic, as well as big pike in Canada. Bart is the senior guide at Tight Lines Fly Fishing Company in DePere, Wisconsin and a genuine fishing bum. Not many people can say they put over 30, 000 miles per year on their cars driving to fishing spots. Bart can. Having guided anglers in Wisconsin, Montana, and Colorado, Bart puts years of experience to work for his clients. A wonderful caster and fly tier known for his patience, Bart is an excellent fishing resource. He knows the entomology, the water, the fish and the directions! A trout fisherman first and foremost, Bart spends his late summer months chasing giant smallmouth bass in his drift boat. Bart truly is one of the busiest Smallmouth bass guides in the country. This is for good reason; he spends more hours on the river and understands the fish better than most. Bart has been seen on ESPN Outdoors, OLN as well as in many fly fishing publications. Watch Bart in ESPN Outdoors. 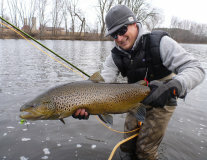 Nate is a full-time guide and instructor for Tight Lines Fly Fishing Company in De Pere, WI. He has worked there as a guide for over seven years now and runs trips for smallmouth bass, lake-run brown trout, steelhead, spring creek trout and muskies. He has also written several articles for various fly fishing publications and is featured in the newly released DVD, “Off the Grid”. Nate grew up on Western Wisconsin waters, a stones throw from the banks of the fabled Kinnickinnic River. At the age of ten, with fly rod in hand, he started probing the Kinni and other nearby trout streams. His love of the sport did not just pertain to trout, as he quickly fell in love with chasing pike and bass with the fly and eventually, steelhead. Nate is married with two children and currently resides in Shawano, WI. 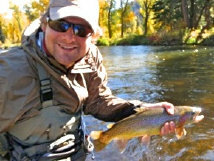 is the owner and operator of First Adventure Trips and First Adventure Fly Fishing. Located high in the Colorado Rockies, A.J. 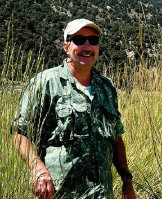 leads guided adventure fly fishing, back packing and rock climbing trips in Estes Park.A popular speaker during the off season, A.J. travels and conducts clinics and presentations related to fly fishing and outdoor activities throughout the country for numerous groups. Communicating and working with new anglers through his guiding and presentations is a special passion, influencing and encouraging others in conservation and appreciation of the sport.A.J. is on the Pro Staff for companies like R.L. Winston Rods, St. Croix Rods, BlueSky Furled Leaders and Patagonia Outdoor Apparel. He also travels and competes with “Team Caddis”, which won third place in the American Cup Fly Fishing Tournament. His first love is guiding for wild trout in Rocky Mountain National Park and San Juan Mountains. A.J. is also an accomplished guide for western river smallmouth bass, huge Lake Michigan carp and Columbia River Watershed steelhead. A.J. and his wife Jen, along with daughter Ainsley, reside in Colorado’s Front Range. 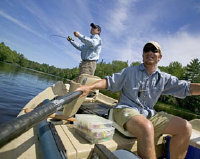 Not many men practicing the art of fly fishing have more breadth and depth of experience in both fly fishing and tying. Gregg learned to fly fish from his illustrious and famous uncle, the late Joe Brooks. Beside benefiting from Uncle Joe’s influence and teaching, Gregg was also befriended and mentored by the great rod builder Russ Peak – the master in glass. Peak rods are valuable collector pieces now. A consummate fly tier, Gregg tied commercially for years. He has fly fished all over the world, both fresh and saltwater. Gregg lives with his family in Southern California. Besides his valuable advice to BlueSky, he also tests fly lines for Scientific Anglers. John is an avid Florida fly fisher. While growing up in Missouri, he honed his fly casting skills on freshwater lakes, ponds and streams as he fished for bass, bluegill and rainbow trout. He and his family live in central Florida and John fishes mainly on the west coast of Florida for his favorite targets of Redfish, Trout and Snook. John has been using BlueSky Furled Leaders for over 5 years and has been a technical consultant .John is also involved with fly tying and has developed several original fly patterns that he has been using and sharing with his fishing friends in Florida, Massachusetts and Louisiana. Don is a retired college professor whose interests in fishing has taken him to many fresh and salt water angling destinations, none more treasured than his cabin on Lake Superior and the Boundary Waters Canoe Area Wilderness. He is best known for his book,Tarpon On Fly, which was co-authored with Capt. Rob Fordyce in 2002. 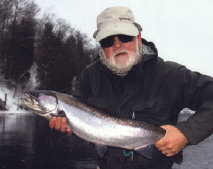 Don is well known as a speaker on salt water and fresh water fly fishing. He has given many talks at fly-fishing club meetings and workshops and has published articles in Fly Fishing & Tying Journal, Salmon Trout Steelheader, Fly Fisher, Atlantic Salmon Journal, and the Lake Superior Steelhead Association Annual.In 2006 he received the Federation of Fly Fishers Silver King Award for his efforts to increase the interest and enhance the skills of anglers in salt water fly fishing. David learned how to fly fish on the upper reaches of the Dart River on Dartmoor in the west of England. Fishing out of a coracle in 1951 David caught his first river-run five-pound Mahseer (Indian Carp) on a fly in South India. As a young man he fly fished for Atlantic salmon in the Hebrides, and spent countless hours in the salt fishing off-shore for Yellow Fin Tuna, Barracuda, Dolphin and others in Indonesia, Sabah and the Philippines. David settled in Washington State in 1978 and spent much time early on fly fishing in the salt for salmon and sea-run cutthroat. He has fished in Eastern Washington, Canada and Alaska for Pacific salmon, browns, steelhead and rainbows, and the Caribbean for bonefish. David has for the last six years spent a great deal of time learning how to sight fish for carp. 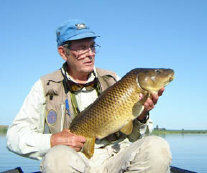 He feels that carp are the most difficult and demanding fresh water fish to take consistently on a fly. Dave brings over twenty years of fly fishing experience, and fifteen years of guiding to the table. In the past, he was the driving force behind two-handed casting in the Great Lakes theater. With almost two decades of Spey casting under his belt, he has a lot to teach. More so, Dave has been on the cutting edge of fly design for steelhead and just about any other migratory fish. He also happens to be one of the country’s foremost authorities for smallmouth on the fly. Outside of Dave’s wealth of knowledge and experience, he brings a genuine enthusiasm fueled by his deep passion for fly fishing.Dave is featured in Skagit Master 4 DVD. Watch Dave in Skagit Master 4.